I’m sure that many coffee-lovers have a Cafetiere (or The French Press) at home. However, is the coffee you make in it – tasty or a bit weak and bitter? Do you find that cleaning it is a bit of a bind? 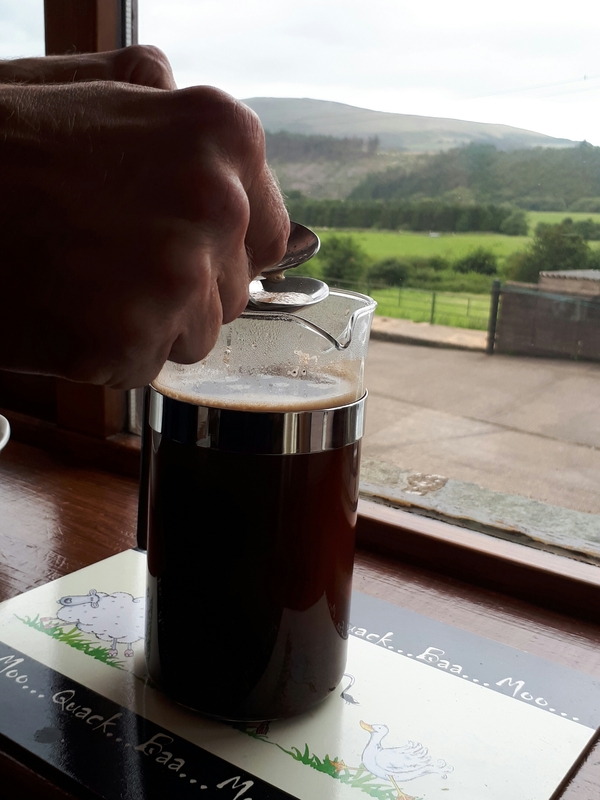 Well let’s look at how a coffee house would prepare your Cafetiere at the table. A common rule of thumb is 60 grammes of coffee per litre of water. Let’s make 800 ml (0.8 L), enough for 4 people; so that will be 48 grams of coffee (60*0.8 = 48). . Boil at least a litre of water in your kettle, so that you have some extra water to warm the Cafetiere and your cups. With scales weigh 48g coffee beans and grind coarse, similar consistency to sand, or if pre-ground make sure it’s specifically for a Cafetière. If it’s ground too fine the coffee will taste more bitter. While you have been weighing the coffee the kettle will have cooled, ready for pouring. 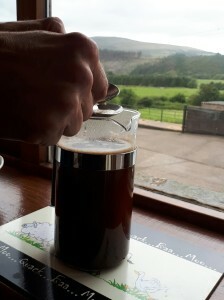 Empty the Cafetiere and put it on the scales, add the coffee and tare (set to zero). Pour in 100g of hot water to cover the coffee, and let it stand for 30 seconds. Now pour in the rest of the water (800g/800ml in total). Leave for another 2 minutes (total 2.30), give a good stir , then scrape away any froth (the bloom) with the spoons (see diagram). Put the lid on , but do not plunge; this allows the gauze to heat up for half a minute . Now it’s time for a gentle 30 second plunge all the way to the bottom (total 4 minutes). Discard water from the cups and pour the coffee in immediately, otherwise it continues brewing. 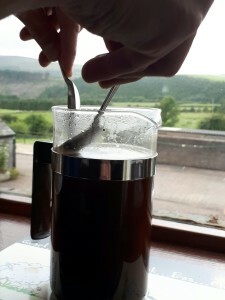 Amazingly, Step 4 makes cleaning the Cafetiere a lot easier, just hold the bottom (when cool) and flick grounds into the compost bin; it just comes out as it relatively dry. I’ve found that a big press is no good for less than 500ml of water. For smaller cups use a one person Cafetiere, I suggest 250ml water, and 15g coffee. It may seem at first a little drawn out for your cup of coffee, but it’s worth it and become second nature after a few times of using this recipe. Don’t forget you can always pop in to see us at Heaton Chapel station to ask for advice. 2) If you love coffee and you can afford it, then having a grinder will give a much nicer brew. This is because ground coffee deteriorates much quicker than when a whole bean. If you have grounds keep in a air tight container in a cool dark place. Keeping in fridge/freezer doesn’t really help.